If you look closer at American interiors in magazines, you’re likely to notice that all living rooms depicted there have several features in common. As a rule, these are a soft comfy sofa of some neutral color, a couple of upholstered arm-chairs and a nice coffee table with many beautiful things arranged on its top. And this very table – not a sofa, a curtain or a chandelier – is the main character of this living room. But the most interesting thing is that if you put a few photos of American lounge areas in a row, you’ll find out that all the coffee tables are decorated according to the same principles. 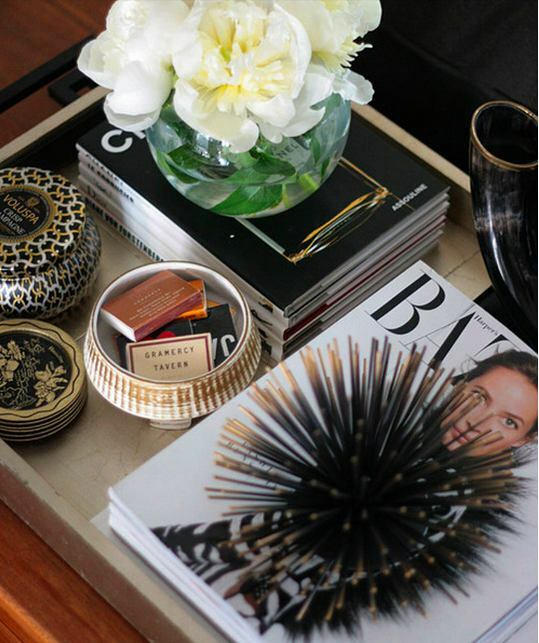 That is true, and HomeKlondike is glad to share 4 golden rules that will make your coffee table as stylish as in a glossy magazine. Closer to the edge of the table (even if it’s round) one or two tall items should be arranged. Ideally, these should be candlesticks and/or a beautiful flower vase. In the middle of the table you should put a florarium, a bouquet of flowers or something else associated with the wild nature and eco-style. This composition must have a bigger diameter than the highest piece on the table, and, of course, should be lower than it. Also, make sure that the flowers do not match the predominant color scheme of the living room; quite the opposite, it must be a bright splash of color. Opposite the candlestick or tall vase, some original and eye-catchy detail should be arranged: a big coral, a sea shell, a piece of Murano glass or something like this. This thing should be related to your hobby and be pleasing to touch. Mainly for this purpose, actually, this something is required on a coffee table: so that you were striving to touch it and have a closer look at the details. And a finishing touch of the composition is a pile of books on arts, architecture, photography or fashion. This detail encourages conversations with your guests and entertains them. However, any rule needs an individual interpretation. In the following examples you’ll see that these tables are decorated with some deviation from the golden rules, but they all still have well-though-out and visually harmonious compositions. 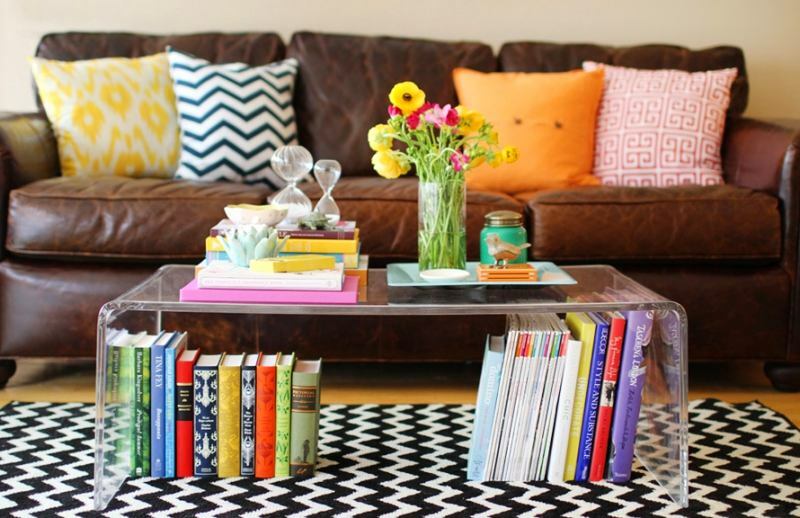 If you have two coffee tables, they should share one common composition anyway. And there should be two high pieces, like in this example. 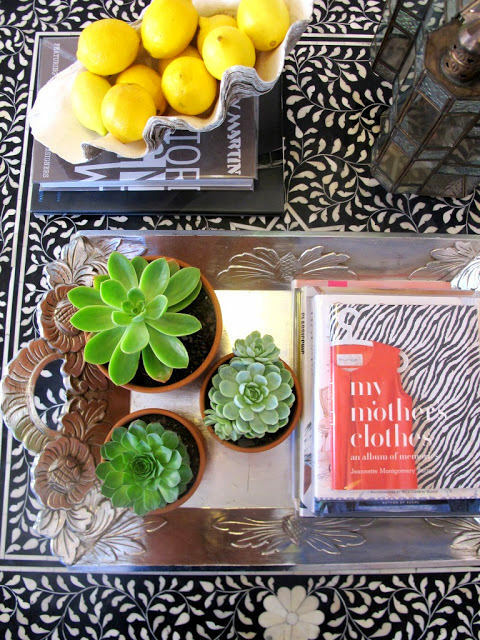 Here books are integral parts of décor. A splendid solution! 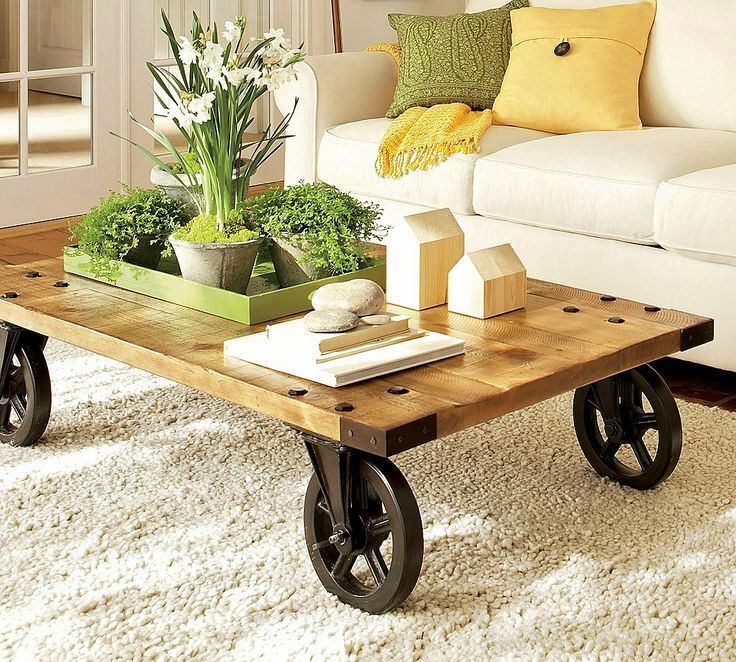 This coffee table is just perfect. The role of a high item is played by daffodils. An element of wild nature is the greenery around the flowers. Eye-catchy pieces are wooden houses. And a pile of books is also present and complemented with eco-style stones. Just charming! By the way, pay attention to the presence of trays on some photos – they help to bring all the items together and create some visual borders and the sense of order. 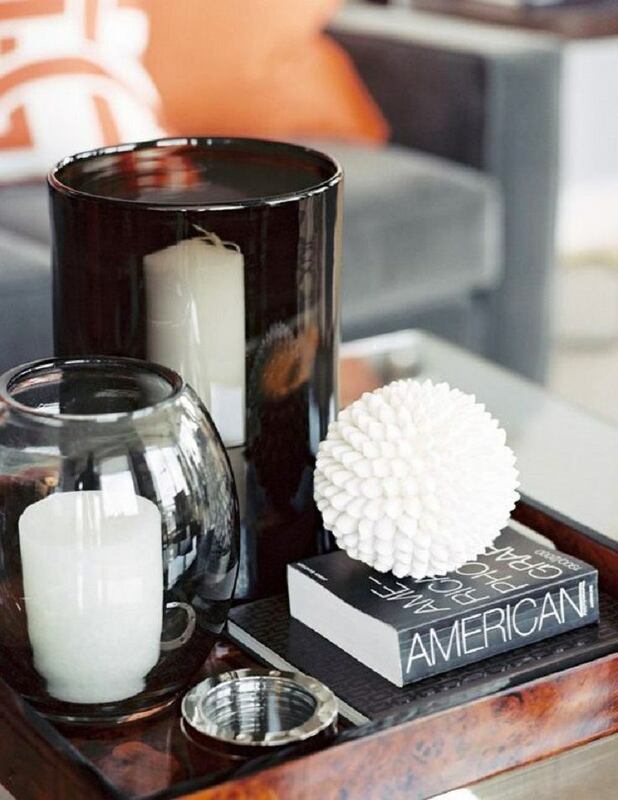 By the way, fruit bowls can also be a good piece of décor for a coffee table. Here you won’t find any flowers, but there is a spectacular play of black and white, matte and gloss. 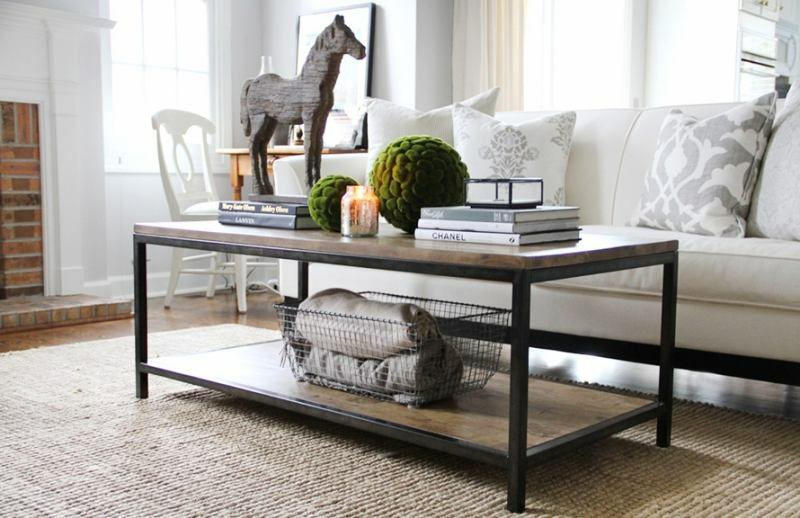 This coffee table does without a high piece, but its composition is flawless anyway. And a set of fashion magazines is just what a female company needs.